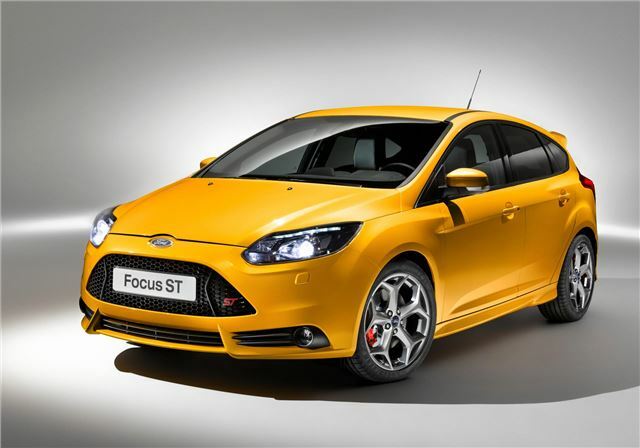 Ford has shown a production ready Focus ST hatchback alongside a surprise estate version. Both are dramatically styled, with large, open mouthed grille, distinctive alloy wheels, trapezoidal centre exit exhaust and sporty spoiler. Both the estate and five-door launch in 2012. Power comes from a 2.0-litre four cylinder EcoBoost engine, combined high performance with reasonable fuel economy. Despite having one less cylinder and a lower displacement than the 2.5-litre engine fitted to the outgoing ST, the new engine produces more power - peak output is 250PS and peak torque is 360Nm. Special efforts have been made to tune the sound of the new engine to ensure it is as appealing as the naturally pleasant offbeat sound produced by a five-cylinder engine. “People loved the sound of the previous Focus ST,” said Jost Capito, director of Global Performance Vehicles. The Focus ST is front-wheel drive, but thanks to a torque steer control system it should put its power down in a controllable manner. Handling is enhanced by computer systems – Torque Vectoring Control (TVC) and Control Under Steer Control (CUSC) control the amount of torque sent to the wheels to keep the front end of the powerful ST in check when driven hard, as does sports suspension. The interior of the ST features a darker headlining, new steering wheel, gear lever and pedals and the standard seats are replaced with Recaro sport seats. UK customers will be able to buy three trim levels, ST1, ST2 and ST3. Precise details are yet to be confirmed, but entry level ST1 models will get keyless start, while top models get much more, including 8-way adjustable leather trimmed seats. Both ST hatchback and estate models will be available next year. For more Frankfurt news, click here.